RV generator to provide power in their house]. With Hurricane Ike, some neat stories . . .
refrigerator, e.g.] . . . How do I go about pumping 50 amps back into the stick house?" I tried to find a more current (get it?) 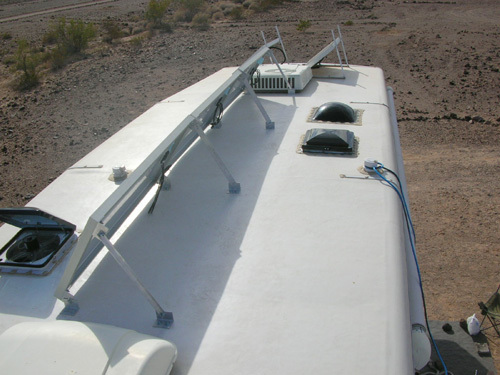 thread on an RV forum directly related to using the solar panels on an RV to power some of the appliances in a house when the motorhome or trailer is sitting out in the driveway but this is the closest I could come. 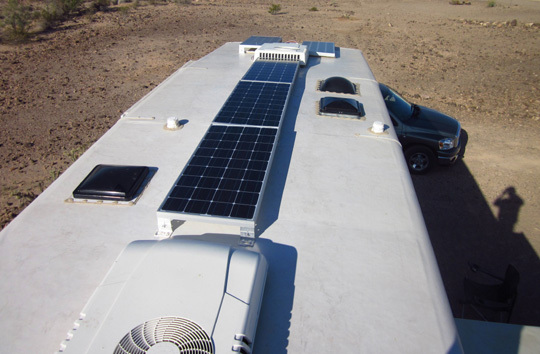 The principle is the same -- going "off-grid" by using solar panels or a generator that is just sitting there, waiting for the next trip in the RV. Why not take advantage of some free or inexpensive power, either in a power outage or just to save money? Jim has this down to a science. Fortunately, we've never had to use the camper generator or solar panels during a long power outage. We've just used them to save some $$$. WHAT IS A "STICK HOUSE?" 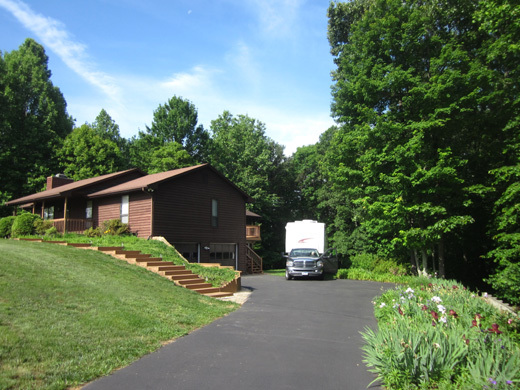 Although we travel in our Cameo 5th-wheel coach nine to ten months a year we still have a "stick house" in Virginia that we visit in the spring and fall. "Stick house" is the term RVers often use when they refer to their dwelling that is affixed to some dirt somewhere. As I've mentioned on this website several times previously, because of the lousy real estate market we haven't tried to sell our stick house and travel full-time in our rolling residence. We want to do that when the housing market improves. We returned to our house near Roanoke on April 1 and left this morning for our grand summer adventure to Alaska. During those six weeks Jim once again hooked up the solar panels on our camper -- now 485 watts strong -- to run the TV and some lights in the house while we were there. 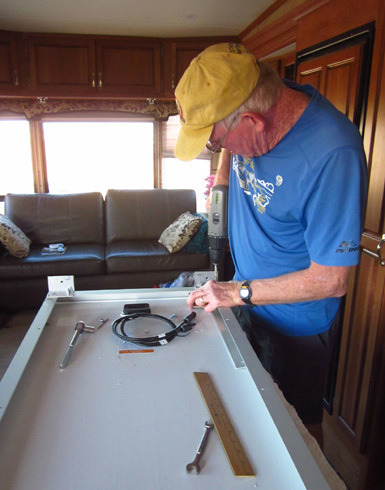 The idea to use power from the RV came to Jim in the middle of the night five or six years ago when severe thunderstorms were rolling through the Roanoke Valley. He was concerned about the power going off for an extended period of time and wanted to be able to keep food in the refrigerator and freezer cold. He knew some folks purchase a generator just for such emergencies, but he reckoned we should be able to use the one we already had in the camper. The next day he figured out how to wire the generator from the HitchHiker 5er we had at the time to the breaker box in the garage of the house. Although he has the electrical skills to install a special box and automatic switch, he never did that. He figured if we had a power outage it was easy enough to just manually plug in to the generator (after turning off the main breaker). We've never had more than a brief power outage when we've been at the house so he's never actually hooked up the HitchHiker or Cameo generator to the house. He knows he can. About the same time he came up with an even better idea -- using silent, free power from the camper solar panels during an emergency . . . or simply to save money. The generator could be still used as a back-up in an emergency if it was too cloudy to collect enough solar energy. Even our relatively quiet Yamaha 3000 generator is noisy, however, and it uses gasoline. So it is not our first line of defense. All five panels can lay flat or tilt to catch the sun's rays better. The HitchHiker had two solar panels generating 160 watts of power, which was enough to run my computer and the lights in two bedrooms of the house for several years when we were there in the spring and fall. With the four new panels he installed on the roof of the Cameo this summer (plus one of the old panels) we now generate 485 watts of power at max. That can run more stuff in the stick house. Jim turns off the circuit in the main breaker that connects to the circuit he wants to power with the solar panels. 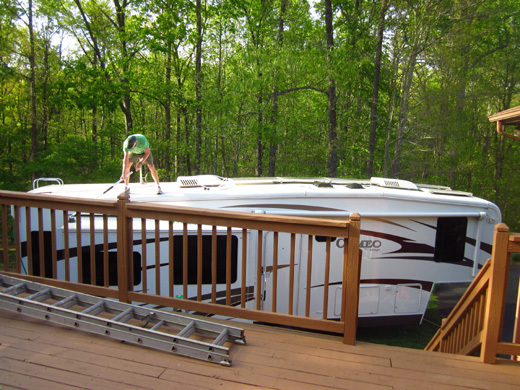 Then he plugs in the extension cord running from the camper to the house into the circuit where he wants the power to go. For the past six weeks he's been using it for the TV and lights in the large open space that contains the family room and dining area. On days that are sunny enough, that is. About a third of the time we were at the house this spring it was raining or too overcast to produce enough power to run even the TV and some lights. In that case Jim unplugged the cord from the house to the solar panels, reset the breaker, and used electricity from the house. 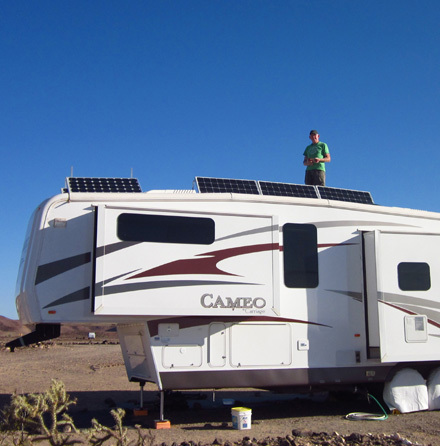 He still collected as much solar power as possible in the camper batteries, however. This concept works in reverse, too. Sometimes we've needed power in the camper and it's too cloudy to get enough solar power. 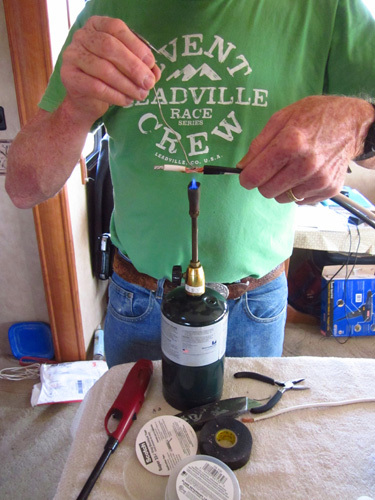 Then Jim runs an electrical cord from the house to power the RV refrigerator, vacuum cleaner, or whatever. Last fall we experimented with leaving the Cameo out West when we returned to our house in Virginia. I explained in an earlier entry why that didn't turn out as well as we'd hoped. 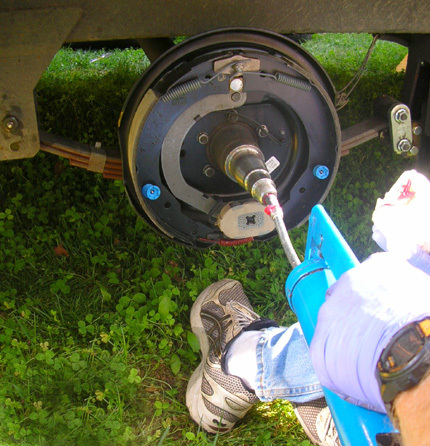 Among other things, it's much easier for Jim to do maintenance on the camper when it's sitting in our back yard or in the driveway than when we're in a campground. 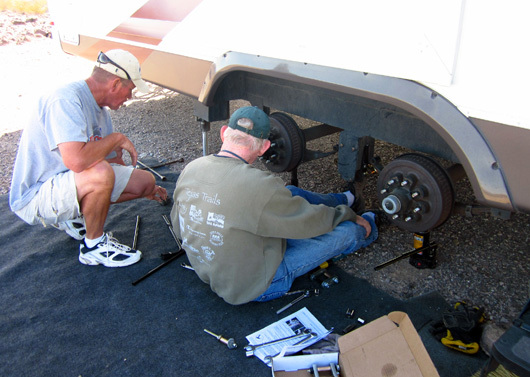 Yes, he was able to install the new solar panels and shackles/wet bolt kit out in the desert at Imperial Dam in February-March, but he never could have done the messy, time-consuming shackle job in a "real" campground. A neighbor at Imperial Dam came over to watch Jim work on the shackles/wet bolts for a little while. 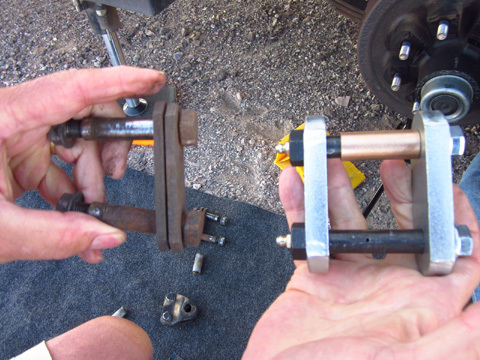 Out with the old (L), in with the new wet bolt kit (R); Jim can lube the "wet" bolts. 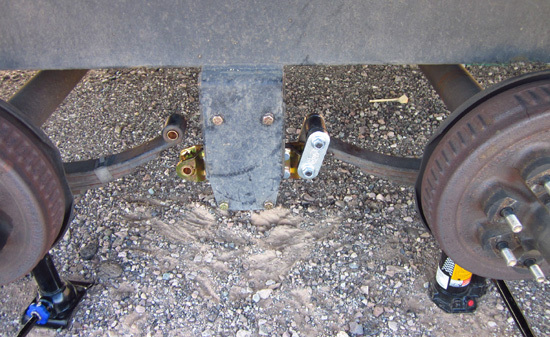 but the Cameo's BigFoot levelers (not shown) held the weight of the camper. So we brought the Cameo from Arizona to Virginia once again. And we'll take it to Colorado this week (then up to Alaska). We're both glad we kept it with us. April 15 at the stick house . . .
disassembled and cleaned the water heater element and water pump filter, lubed the slide motors and gaskets, replaced 14 halogen lights with LEDs, and vacuumed/shampooed the carpeting. Whew! He spent a lot of time out there working on the camper the last six weeks. I helped by staying out of his way and doing other jobs like weeding and painting that he didn't want to do. I helped him shampoo the carpet and did a thorough clean-up of the interior of the coach. 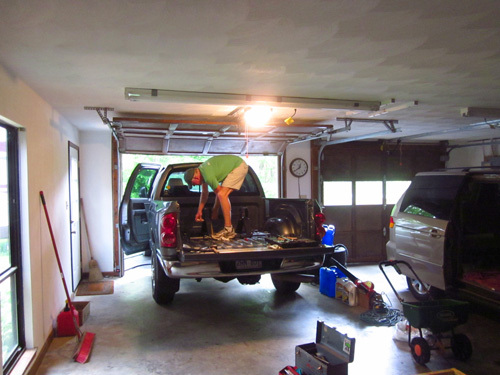 Jim was also busy with maintenance on the truck (2008 2WD Dodge Ram 2500 diesel). 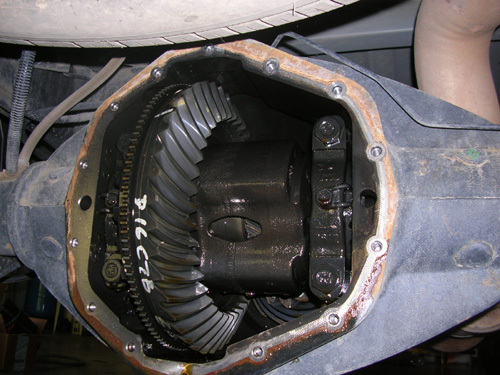 He replaced the fuel filter, drained and replaced the oil in the differential, thoroughly cleaned the truck inside and out, and waxed the exterior. In addition, we have a new camper hitch head in the truck. 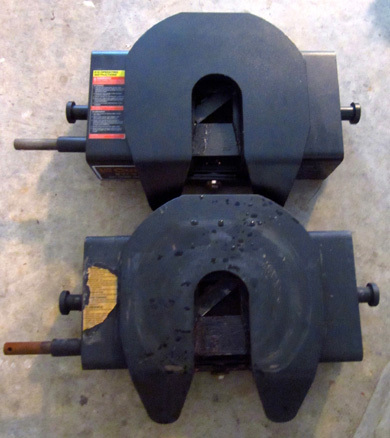 Jim had been having some trouble with the 16-ton Curt hitch he purchased separately when we bought the Cameo in early 2010 so he called the manufacturer a couple weeks ago. A representative for Curt acknowledged that some customers have had the same problem. He promptly sent us a new head for the hitch mount at no cost. It was easier for Jim to install it himself than to find someone local to do the work before we wanted to leave town. There was a small "hitch" with the new hitch but a little filing of some metal did the trick. Jim called the company to make sure his fix was appropriate (it was). The current model is a tiny bit different than the one we had but it appeared to do the job after a test drive with the Cameo. Jim postponed changing the oil and filter because it's too soon. He'll do that at the auto hobby shop at the USAF Academy when we get to Colorado Springs next week. When we're traveling the best place for Jim to do work on the camper and truck is at the military posts/bases where we sometimes camp. Our 2002 Honda Odyssey van remains at the house in Virginia when we travel. We still manage to put about 1,000 miles on it each spring and fall when we're there because we live about 20 miles out in the country from downtown Roanoke. The van has over 100,000 miles on it now but it still runs well, thanks to all of Jim's regular maintenance. He changed the oil and filter while we were there this time. Knowing what to take with us on each extended trip has been a learning curve over the years. By now we're able to leave more things in the camper each time we take it to the house -- like clothes and kitchen items -- and we take less new stuff with us when we leave, especially food and items we can easily purchase along the way.. There are still a lot of things we take into the garage or house each time we go back. The refrigerator must be emptied, we need some kitchen utensils that aren't duplicates, some clothes need to be washed and/or exchanged for others, Jim needs to use most of the tools he carries on trips, etc. We both still end up hauling a bunch of stuff up and down the stairs each time we come and go. It's just less each time. 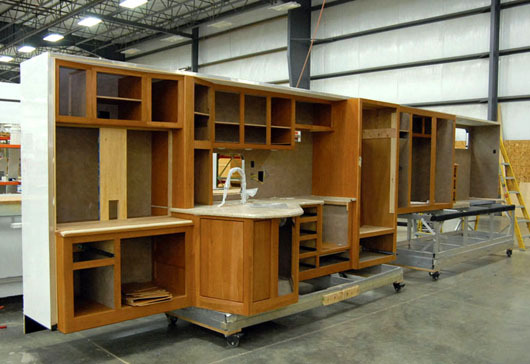 the company incorporated TOO much storage space in its coaches, encouraging overloading. There are some items that are trip-specific, such as the travel information we take (maps, AAA tour and camping books, etc.). 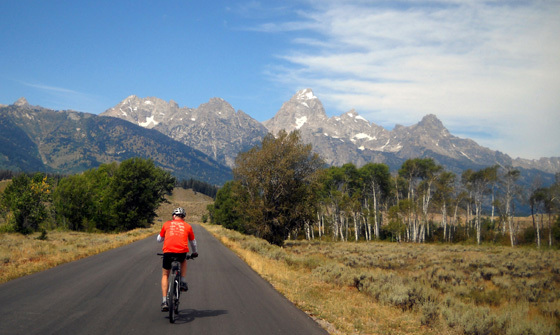 We increasingly rely on the internet, topo software, and our Garmin vehicle GPS for travel information, however. You'd think that our clothing needs would be different for our "summer" and "winter" trips but they aren't. Keep in mind that we live in the "Dandelion Time Warp" as much as possible, where we're just as likely to run into chilly weather in the summer as warm weather in the winter. We take versatile clothing like convertible pants with legs that zip off and lightweight fleece jackets that can be layered. We are taking a few more "winter" clothes with us this summer, though. Unlike most of the rest of the country, Alaska had a tough winter with record-breaking levels of snow in some of the places we plan to visit. I think we're ready clothes-wise for whatever weather we encounter in Canada and Alaska. Hopefully, the camper and truck can withstand the long distance and the road conditions. Jim has kept both vehicles in excellent shape and all the tires are relatively new. The more we travel in our RV, the less we've learned to live with. It's amazing how much we've simplified our lives by reducing the "stuff" we have. That's one reason why it won't be all that hard to sell our house and get rid of many of our possessions there. If we can live without them for nine or ten months of the year, we can probably live without them, period.